I will admit I went from walking 2x per week to running daily (about 40 min) and after the first 5 days I started to feel some knee pain (in my right knee) at the beginning of the run. The next day I couldn't run. And now I can't even walk without pain. The pain is to the left and below the knee cap. It feels bruised to the touch but very little visible swelling. No pain while sitting or laying down. I rode a bike yesterday and it didn't hurt while riding but then after the pain was very bad. Thanks for your question about running and knee pain. I guess you have already pointed out the main culprit for this pain: too much, too soon. Your knee is one of those body parts that is very heavily impacted by running. The constant movement in and around the knee and the impact the knee and lower leg take every time your foot lands... it's no wonder knee pain is one of our most "popular" running injuries. My advice is to take rest for a few days and apply ice. After that, ease back into running. If you don't feel like it, you don't have to start with a run/walk program, although it is a good idea for a beginning runner. 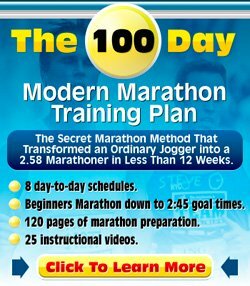 You may want to have a look at my Beginner Running Programs anyway, just to get a feel for how they build up the mileage and the time spent running. What you really do need to do though is have a look at my increasing mileage safely page. It provides you with some sound advice about increasing mileage. For now, have a rest and make sure you recover well. I know it's annoying, but if you do not take action now you may end up with a chronic knee injury which is far more annoying than a week of rest! Best of luck with the knee pain. Hope you will be able to run and exercise soon again.